First, a note to local readers before today’s brief entry: UBC Botanical Garden has launched its Workshops, Lectures and Tours schedule, and it starts with a free noon lecture this Friday by Ernesto Sandoval of the UC Davis Botanical Conservatory. Ernesto will be talking about the “Plant Diversity of Baja California”. Please attend if it fits your schedule! With a bit of imagination, one might see the Vulcan salute in the first image of today’s entry. Live long and prosper. Good evening Daniel After seeing the picture of the very red magnolia blossom you posted a few days ago my sister and I took a bus ride out to UBC with the intention of looking at the magnolia trees at the Botanical Garden. However we could not figure out where to get off the C20 bus and gave up. But on the way home coming along Burrard St.and just after we got off the Burrard bridge we spotted a group of very red magnolia blossoms on the corner of Beach and Burrard. 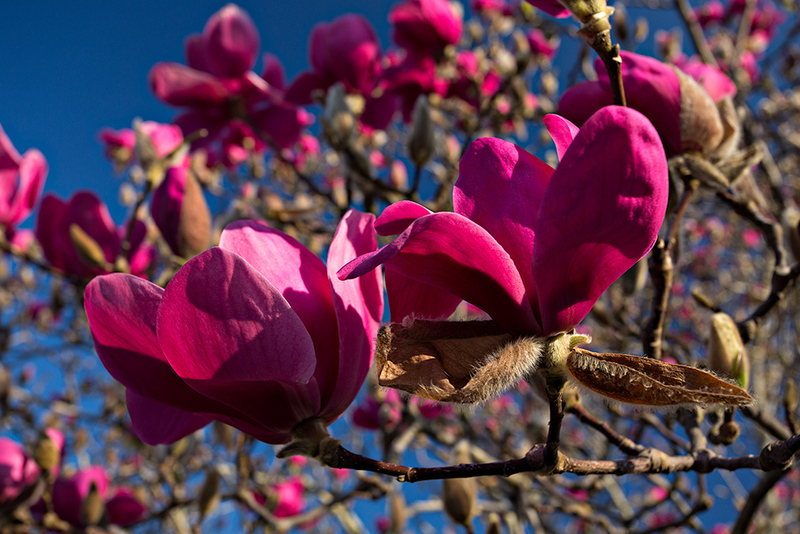 I did a search on my computer and found the site Vancouvers top 10 street trees for flowers. 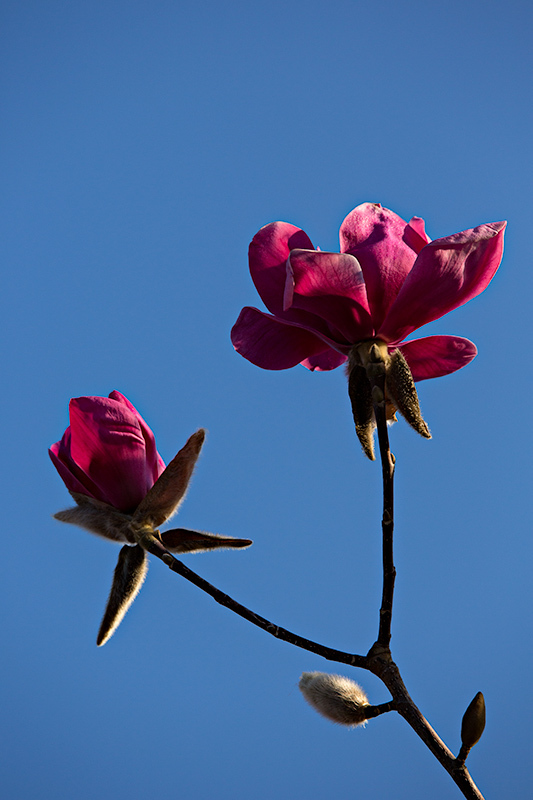 There we found that they are magnolia Vulcan so went by bus next day to photograph them. Got some very good pictures. The colour is obviously ideal for the buildings in the background of the third photo, not by coincidence I am sure?! There has been a problem with some plants in Britain and the Pacific Northwest blooming a not very appealing purple for years – I grew one myself for some time that never did produce any red flowers, eventually got cut down for that reason. It may have been as much as 10 ft. tall or more by then. 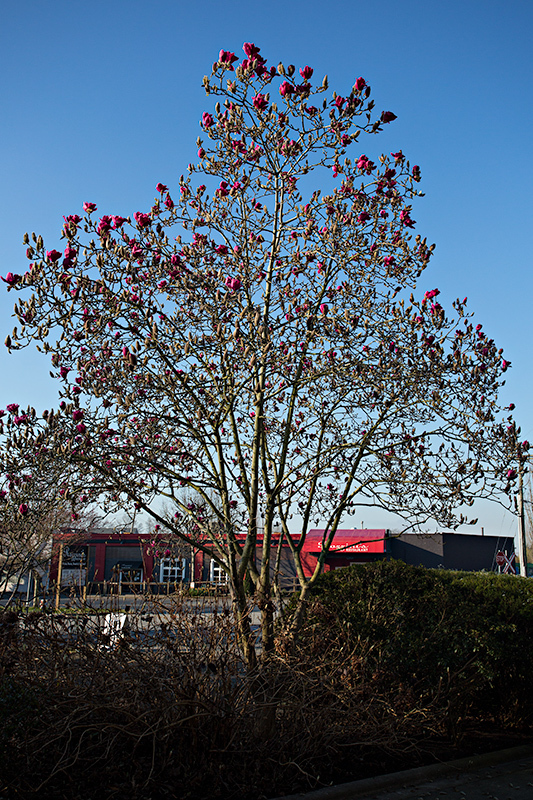 Yet I have seen other local plantings blooming red, as the UBC tree shown here obviously is. Mine was grafted, I wonder if propagation method somehow has anything to do with it. Mary, sorry to hear you had difficulty on the shuttle. Transit to the Garden has been a long-standing issue for us. Next time, the correct stop is “Stadium Road”. And, just a small addendum — this photograph was taken in the community of New Westminster, not at the Botanical Garden. We sadly don’t have a ‘Vulcan’ in our collection (yet? ).